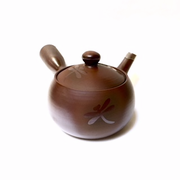 Chocolate brown teapot with contrast dragon motif. Mesh spout strainer. 3 3/8" diameter opening and 3" height.